Amazon Simple Email Service (Amazon SES) lets you send transactional email, marketing messages, or any other type of high-quality content to your customers. Click the “SES Email Sending Service” option. In the left navigation bar, click the “SMTP Settings” option. Click the “Create My SMTP Credentials” button. Copy your credentials or click the “Download Credentials” button as the password will not be shown again. 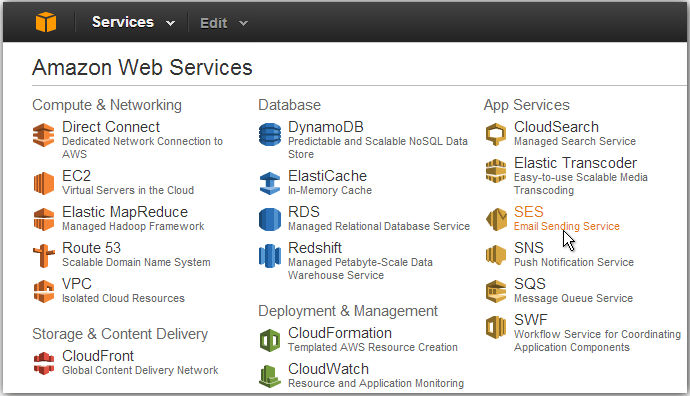 Log into the Amazon SES Console. Click the “Verify a New Email Address” link. In the “Verify a New Email Address” dialog, enter the email address you wish to send messages from and click the “Verify This Email Address” button. You should now receive a verification message from Amazon SES asking you to confirm that you are the owner of the email address. Click the verification link in the message. NOTE: The verification link is only valid for 24 hours after your original request. Check the status of the email address in the Amazon SES Console. The status of the email address should change from “pending verification” to “verified”. You can now use Amazon SES to send email messages from this address. To send a test email, check the box next to the verified email address, and then click the “Send a Test Email” button. Refer to the Amazon SES documentation for more information. To protect customers from fraud and abuse, Amazon SES does not immediately grant unlimited Amazon SES usage to new users. A number of restrictions are initially in effect, such as only being able to send email to and from verified email addresses and being limited to a maximum of 200 messages in every 24-hour period. To remove these restriction on recipient addresses and increase the sending limits, request a higher level of access in the Amazon Support Center. The final step is to configure your Bitnami application to use Amazon SES. The procedure to do this varies from application to application but typically, you will need to configure the application with the correct SMTP server information and credentials. This may be done either by directly editing application configuration files or by entering the required information using the application user interface. Here’s an example of configuring email settings for Amazon SES. The USERNAME and PASSWORD placeholders should be replaced with the correct values from the credentials created in Step 1, while the EMAIL_ADDRESS palceholder should be replaced with any SES-verified email address.